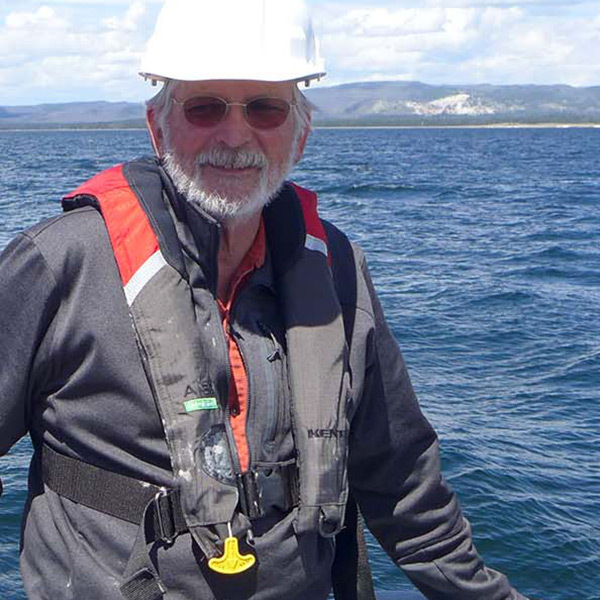 I am a co-Principal Invesitgator on the project and am a hydrothermal geochemist with long experience working on Yellowstone hot spring fluids and deposits, especially on the floor of Yellowstone Lake. I am working on pore fluids, sediment composition, and hydrothermal alteration in gravity cores and piston cores, and I am part of the team sampling sublacustrine hot springs by ROV. I will be conducting stable isotope (H, C, O, S) analyses and geochemical reaction modeling on hydrothermal fluids and hydrothermal deposits. Yellowstone presents a unique opportunity to study active hydrothermal processes in a major, ongoing rhyolitic volcanic field. Yellowstone Lake adds a special dimension to these studies. Previous work in Yellowstone Lake has led to the discovery of over 650 active or formerly active hot spring vents. Chemical fluxes from hot springs profoundly affect the geochemistry of the lake as a whole and indicate that it is the third largest thermal basin in YNP. The discovery (by our multibeam sonar mapping in the early 2000’s) that there are major hydrothermal explosion craters (up to 2.5 km in diameter) on the floor of the lake suggests careful studies might show the causes and triggering mechanisms of such steam-driven explosions. By sampling and monitoring the deepest and largest hydrothermal vent area in the lake, we hope to understand the effects of changing lake level, changing heat flow, variations of seismicity in time and space, and changes in hydrothermal fluid chemistry. These and other factors may prove important in understanding the interplay between magmatic activity, tectonics, climate, and other events on changes in hydrothermal activity. As an undergraduate, I took a lot of chemistry (and other basic science courses), geology, and geography classes- and at the start of my junior year the light went on that geology offered the right combination scientific rigor, varied activities including field work, and a field that I could potentially contribute to. I’ve always loved the ocean and marine geochemistry was very intriguing to me. I worked for many years on “black smoker” vents on the seafloor. The transition to vents on the floor of Yellowstone Lake was and is an exciting one! I live in Boulder, Colorado, and have an abiding interest in political activism and urban and regional land-use planning. I currently serve on the Boulder County Planning Commission and the board of Eco-Cycle, which operates the Boulder County recycling facility and has a mission of creating zero waste communities. Otherwise, I enjoy hiking and bicycling, and hanging out with my two daughters.